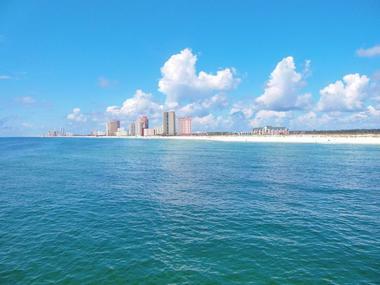 Many of the beaches near Atlanta are found on barrier islands connected by causeways and bridges to the mainland, located along the Atlantic Coast or the Gulf of Mexico. Some of these beaches and island can only be reached by boat, while some are easily accessible on the mainland. The Gulf Coast of Alabama boasts unspoiled natural beauty, culture, history, and sunshine, boasting miles and miles of white sandy beaches. Gulf Shores in Alabama consists of great accommodations and vacation rentals, spectacular special events throughout the year, and award-winning restaurants. All of this is in addition to the white sandy beach and turquoise waters. Visitors may have the chance to spot a dolphin or two or try some deep-sea fishing in one of the largest artificial fishing reefs in the United States. Gulf Shores also features plenty of opportunities for watersports, amusement parks, nature trails, and championship golf. Panama City Beach boasts twenty-seven miles of stunning beaches from which both visitors and locals alike can choose, along with different experiences. Shell Island offers a secluded beach getaway and can only be reached by boat. Situated between the Gulf of Mexico and the St. Andrew Bay, the island is free of development, providing seven miles of island landscape perfect for shell collecting and nature walks. St. Andrews State Park, which offers biking trails, canoeing, fishing, camping, and snorkeling in a jetty, while Camp Helen State Park includes gulf coast fauna and flora, as well as beaches and a freshwater dune lake. Destin, Florida features world famous fishing opportunities, challenging golf courses, and beautiful white sand beaches on the Emerald Coast. 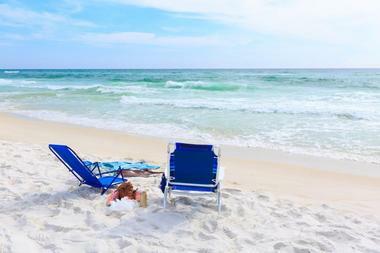 Nestled against the northwest Florida’s area of the Gulf of Mexico, Destin is very well known for its emerald waters and sugar-white sandy beaches. Due to the abundant population of fish in these emerald waters of Destin, the city has earned the nickname of the “world’s luckiest fishing village.” Many vacation rentals and world-class resorts can be found in the area, along with some amazing restaurants and shopping. 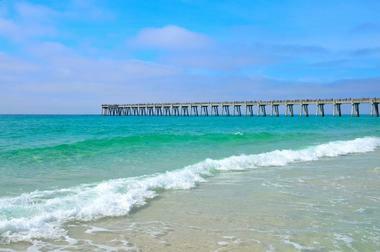 The Northwest Florida Regional Airport also makes Destin a convenient beach destination. Pensacola Beach is well known throughout the world for emerald-green colored waters and sugar-white sandy beaches, as well as plenty of opportunities for relaxation and fun. Visitors will find many other things to do at the beach besides swimming and simply relaxing on the sand. Pensacola Beach offers fishing from two different piers, parasailing, surfing, swimming, stand-up paddle boarding, snorkeling, diving, miniature golf, and more. The area is also home to a number of restaurants serving fresh seafood from the gulf, along with several places to just relax with a drink after a long day at the beach. Jacksonville, Florida boasts around twenty-two miles of beaches, fifty boat ramps, forty miles of Intracoastal Waterway, and the state’s longest stretch of St. Johns River. The city if considered to be the best destination in Florida for watersports and the birthplace of Salt Life. Visitors can enjoy fishing, boating, diving, swimming, paddle boarding, kayaking, surfing and more at one of the many public beaches, including Jacksonville Beach, Atlantic Beach, Mayport Beach, and Neptune Beach. These beaches are pet-friendly and home to parks, seafood restaurants, surf shop, and beach boutiques. Unspoiled barrier islands can be found in the Northside of Jacksonville. Folly Beach is a coastal community and barrier island in the state of South Carolina that is full of charm and history and located only around fifteen minutes away from downtown Charleston. Local residents refer to Folly Beach as the “Edge of America,” a place where visitors can start their day watching the sunrise and end with an amazing sunset. The eastern end of the island offers a spectacular view of the nearby Morris Island Lighthouse. The Fishing Pier at Folly Beach extends over 1,045 feet out into the Atlantic Ocean and hosts several fishing tournaments throughout the year. St. George Island is an unspoiled barrier island measuring twenty-two miles in length off the coast of Florida. The island is one of the state’s last inhabited islands and offers some of the most serene and beautiful beaches along the Gulf Coast. Visitors will find miles of mostly uncrowded beaches that are ideal for shelling and sunbathing, along with clear waters for fishing and swimming, and wildlife viewing in pristine marshes. Well-behaved pets are allowed on the island, as well as in several of the vacation rentals on St. George Island. Occupying the island’s eastern end is the St. George Island State Park. St. Simons Island in Georgia is home to amazing beaches, entertainment, fun events, an array of dining options, salons and spa, charter fishing, and golfing. Part of what makes the island special is its distinctive and charming unhurried beach lifestyle and its unspoiled natural beauty. St. Simons Island is part of the Golden Isles of Georgia and has been voted as one of the country’s most romantic destinations. The island is full of Southern charm and history, boasting live Southern Oaks with Spanish moss, giving it a unique sense of place and time. Bike paths make it easy to explore the island. 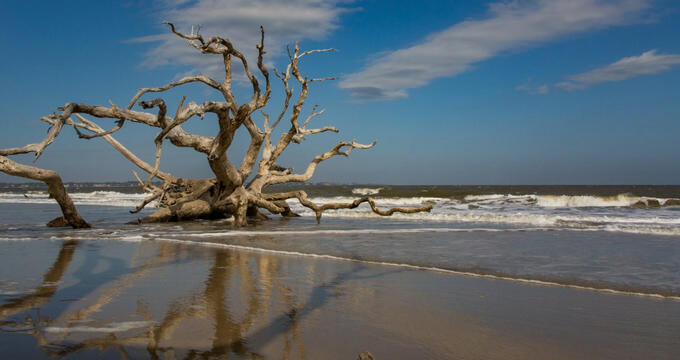 Jekyll Island is a stunning combination of discovery and serenity, from its historic ruins to the sprawling sand beaches. Located within Georgia’s Golden Isles chain, Jekyll Island is close to Brunswick, Sea Island, and St. Simons Island. Each path on the island leads to unique experiences, whether it’s down the oceanfront promenade or through the island’s ancient maritime forest. Jekyll Island boasts a legacy of providing entertainment to visitors, providing ten miles of beaches drenched in sunshine, guided kayak excursions, maritime forest tours, the Historic District, several award-winning golf courses, and the only sea turtle rehabilitation center in the state. 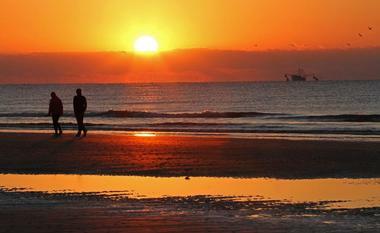 Tybee Island is a small coastal town situated just eighteen miles from the historic area of Savannah. Consistently ranked as one of the country’s top beaches, Tybee Island offers something for almost anyone. The island provides the nearest ocean beach to the city of Atlanta, Georgia. Around the pavilion and the pier at the island’s southern end is the most crowded area of the beach. This section is also where visitors will find the majority off nightlife, restaurants, and shops. The more historic and less crowded area of the beach is the north end, which includes a fort and historic lighthouse. Situated at the southern end of the state of North Carolina’s Topsail Island, Topsail Beach is the island’s smallest beach community out of the three located on the 26-mile island. Visitors may have an opportunity to see the occasional sea turtle, dolphins swimming further out in the ocean waters, and a wide variety of different species of birds if they’re lucky. 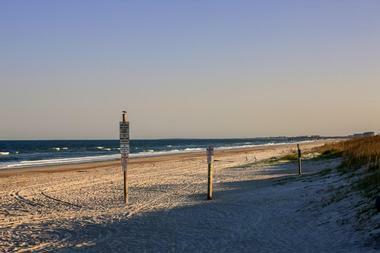 Topsail Beach also offers a wide array of fun by the sea, such as swimming, relaxing on the sandy beach, surfing, fishing, and many other outdoor activities. Topsail Beach is located approximately forty-five minutes from the city of Wilmington. Hilton Head Island, located off the coast of the state of South Carolina, can be found just past the state line of Georgia. At a little over 280 miles from the city of Atlanta, the island is a good choice for people looking for an escape from the hustle and bustle of everyday city life. Hilton Head Island is a popular resort destination with several private gated developments, however, the beach itself is public, with nine public beach accesses available. The island is spread out more than other islands nearby, meaning visitors may need to use their car to get around. As one of the country’s most popular beach vacation destinations, and one of the top vacation spots on the East Coast, Myrtle Beach boast a wide variety of attractions, restaurants serving an array of delicious food, and many different hotels and vacation rentals. 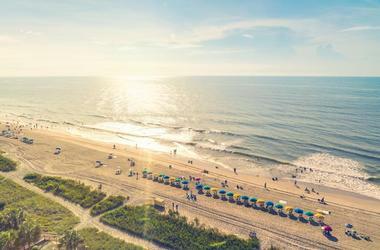 The main highlight of Myrtle Beach is quite possibly the Grand Strand, which is a sixty-mile stretch of beaches that offer plenty of space and sand for visitors. Visitors will find a number of restaurants, arcades, and shops, and along the beachfront boardwalk, along with the SkyWheel, one of the tallest ferris wheels in the United States. Kiawah Island is a barrier island along the Atlantic Coast in South Carolina, boasting around ten miles of pristine sand beaches divided into two different areas known as the West Beach and the East Beach. Beachwalker County Park, situated at the western end of the island at West Beach, provides views of the river and oceanfront with the island’s only public beach access. Lifeguards are present during the summer season at the designated swimming area along the beach. The other beach accesses on Kiawah Island are private, many of which belong to resorts on the island. Fripp Island, located off the coast of South Carolina, is a sanctuary for wildlife and is known for featuring a mostly uncrowded atmosphere. The Fripp Island Golf and Beach Resorts provides visitors with controlled access to Fripp Island, championship golf, more than three miles of uncrowded sandy beach, kayaking, tennis courts, and oceanfront view accommodations. The seaside water park includes a pool for children with an alligator slide. Guests can get around the barrier island by golf cart, rather than use their car, through day or weekly rentals. A food court and several restaurants are available as well. 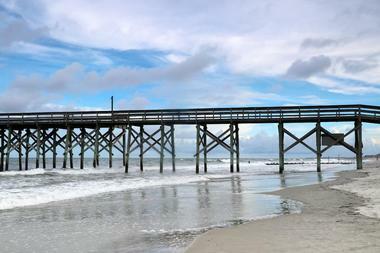 Pawley’s Island is located around twenty-five miles from Myrtle Beach and seventy miles from Charleston. The island off the coast of South Carolina is one of the East Coast’s oldest summer resorts. Visitors with a love for historical building can find twelve residences dating back to late 1700’s through the mid-1800’s in the island’s historic district. Pawley’s Island is known for having a laid-back, carefree, shoeless lifestyle that includes rope hammocks, ghost stories, fishing, and crabbing, as well as delightful, casual, unspoiled wide beaches and sand dunes. A leisurely existence of local residents has developed the island’s charm that continues today. 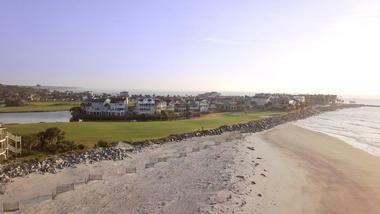 Amelia Island is situated just off of the coast in northeastern Florida. While the island is easily accessible, it is typically difficult to forget. The island is comprised of approximately thirteen miles of stunning beaches, pristine waters, and plenty of native wildlife, making the barrier island a beloved beach destination for both local residents and visitors. There are over forty public beach accesses along the Amelia Island’s thirteen miles of coastline. A guided kayaking tour offers an opportunity for visitors to see more of the natural side of the island. Segway and stand-up paddle boarding tours are also available.